I was mesmerized by the terrific article in The Washington Post written by Craig Timberg entitled: Net Insecurity: A Flaw in the Design. Not only did it feature David Clark of MIT, who spoke at the Cybersecurity Rosk Analysis for Enterprise Risk Security Workshop that my Isenberg School of Management and College of Engineering colleagues and I organized, with funding provided by the Advanced Cyber Security Center (ACSC) and which took place at the Sloan School of MIT last September, but also Richard Stallman, who was a keynote speaker at the INFORMS Computing Society Conference this past January (and I had the pleasure of not only speaking with him but also sharing a taxi with him to the airport). Below are photos of Clark and Stallman (with my great INFORMS colleagues Bob Fourer and Matt Saltzman) that I took at these respective events. The Post article ends with the following prescient sentences: In 2008, Clark crafted a new list of priorities for a National Science Foundation project on building a better Internet. The first item was, simply, “Security.” I could not agree more. Coincidentally, on June 1 and 2, the Future Internet Architecture (FIA) Spring 2015 meeting is taking place at MIT at the Stata building. Although I am in Sweden and will be taking part in a Finance conference in Gothenburg, two of my doctoral students will be presenting there on our NSF ChoiceNet project work, since we are one of five teams selected (and sponsored) by the NSF as part of its very ambitious and visionary Future Internet Architecture program. Our ChoiceNet project aims to construct an economy plane for the Internet, which will allow more choices and cybersecurity is, of course, a possible primary feature. 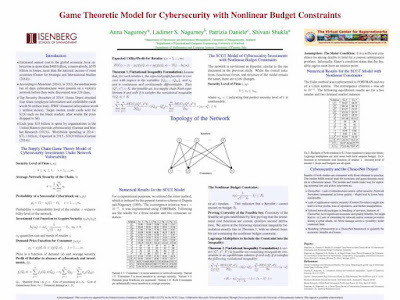 Specifically, on June 2, my doctoral student, Shivani Shukla, will be presenting the poster below, which is based on a paper of ours: "Game Theoretic Model for Cybersecurity with Nonlinear Budget Constraints." 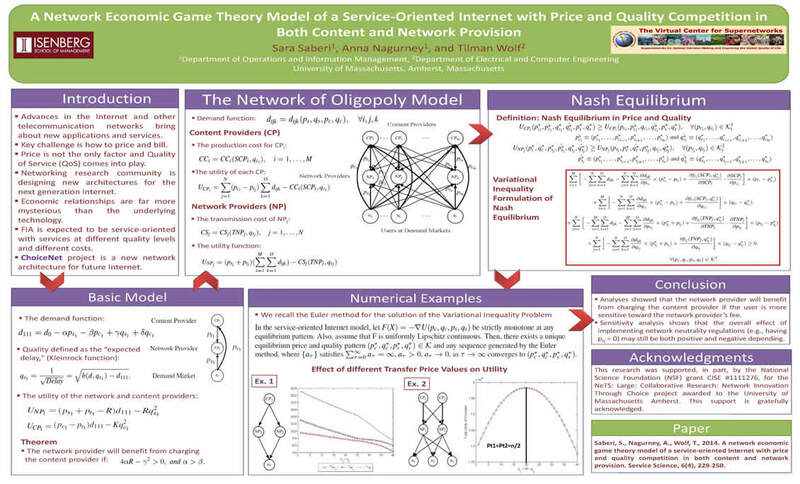 My doctoral student, Sara Saberi, will be presenting a poster on our paper, "A Network Economic Game Theory Model of a Service-Oriented Internet with Price and Quality Competition in Both Content and Network Provision," that was published in the INFORMS journal Service Science. The paper was co-authored with the lead PI on our NSF project, Tilman Wolf of UMass Amherst. My first paper on cybercrime, "A Multiproduct Network Economic Model of Cybercrime in Financial Services," was also published in Service Science. 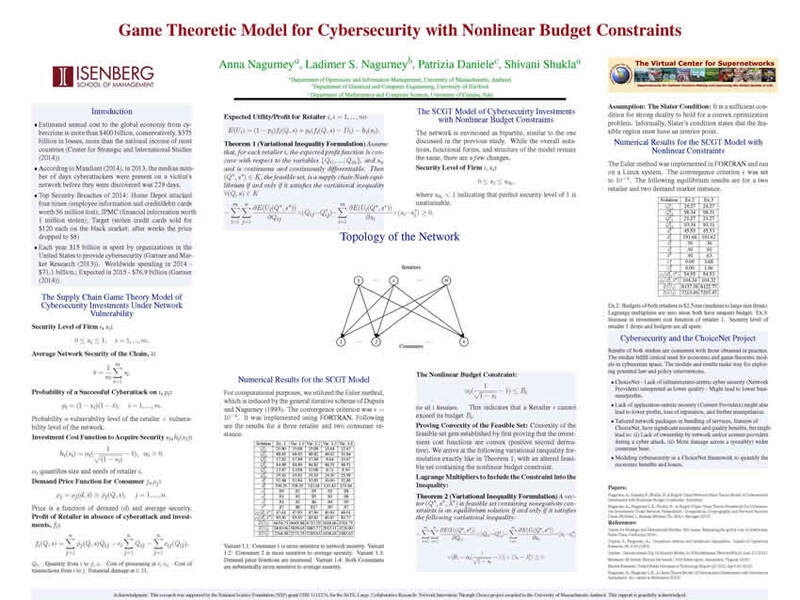 Our paper, "A Game Theory Model of Cybersecurity Investments with Information Asymmetry," Anna Nagurney and Ladimer S. Nagurney, is now in press in Netnomics. Also, our paper, "A Supply Chain Game Theory Framework for Cybersecurity Investments Under Network Vulnerability," Anna Nagurney, Ladimer S. Nagurney, and Shivani Shukla, is in press in the book: Computation, Cryptography, and Network Security (2015), N.J. Daras and M.T. Rassias, Editors, Springer, New York. Since The Washington Post article expands on the challenges faced by encryption, especially in the early years of the Internet, this book should be very timely! Given the importance of cybersecurity, I am delighted that the UMass Amherst Provost Katherine S. Newman is helping to spearhead a new Cybersecurity Institute at UMass Amherst and, with the interest in the topic at the Isenberg School of Management, the School of Computer Science, the College of Engineering, and also other schools at UMass Amherst, this is a very exciting initiative! It's been wonderful to be back in beautiful Sweden! I especially enjoy the great public transportation system - such a contrast to what we have in the United States. This time around, the apartment that the University of Gothenburg has provided for me is not in walking distance of the School of Business, Economics and Law where I am a Visiting Professor, so my commute has been by public transit. My favorite mode of transportation here is trolleys! I have a month's pass of unlimited travel and it is money well spent. There are three types of trolleys (also known as trams) in Gothenburg, based on their ages (vintage) as well as a trolley that one can rent for special events and that flies the Ukrainian flag (my heritage) and is featured below. Gothenburg has the largest tram network system in Sweden. Some of the various trolleys that I have ridden are below. Many of the trolleys have the symbol of the city on them. One of my favorite trolleys is Number 6 since it is only about 2 blocks from my apartment complex and leaves me about 2 blocks from my Business School here. I have never had to wait longer than 5 minutes for a trolley. I like the trolley map in front of the Central Train Station in Gothenburg. Sometimes though, I will purposely hop off the trolley one or two stops before my final destination so that I can walk (another favorite mode of transport for me) and experience the beauty of the landscape here as well as the architecture. Below is my favorite tree in Gothenburg. Whenever I teach my Transportation and Logistics class at the Isenberg School at UMass, which I do each Fall and I love teaching this class, I always ask my students what is their favorite mode of transportation. Regularly, I hear that airplanes or trains are favorites and, sometimes, bicycles. I have to say that my answer will now be trolleys! I very much like interdisciplinary research and being an operations researcher one is able to explore and also to contribute to different disciplines. Here at the School of Business, Economics and Law at the University of Gothenburg, where I am a Visiting Professor, I sit in a suite of offices with Transportation & Logistics colleagues and also Finance ones. Since I used to be in the Department of Finance and Operations Management at the Isenberg School (until the number of students really grew and now we have the Finance Department and my Operations & Information Management Department) I feel so comfortable and welcome here in Sweden. 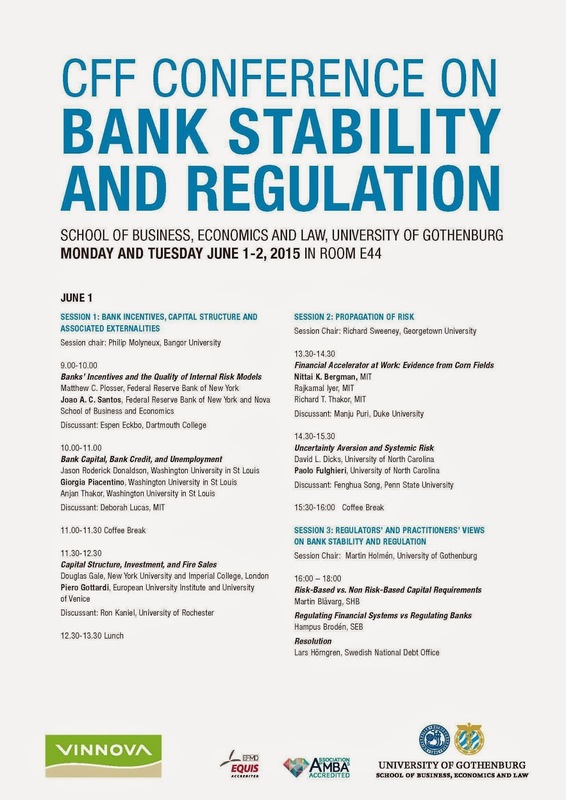 One of my Finance colleagues in Gothenburg, Professor Ted Lindblom, invited me to a conference that is taking place next week here that I am very excited about and will be attending. Moreover, there will be colleagues from MIT and UConn in attendance and even friends of my Finance colleagues at Isenberg, Professor Mila Sherman and Nikunj Kapadia. I am very much interested in systemic risk issues and that was one of the themes of the Cybersecurity Risk Workshop that Mila, Professor Senay Solak, Professor Wayne Burleson, and I organized last September with support provided by the Advanced Cyber Security Center and also Professor Andrew Lo of MIT. 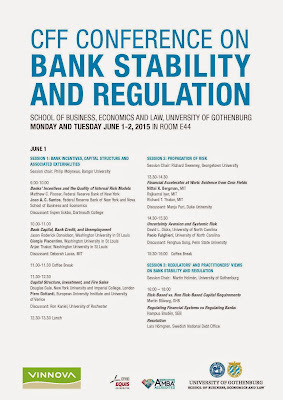 Below is the program for the Banking conference next week -- looking forward to it! There will also be practitioners in attendance and as speakers. More info is here. I'll be reporting on the conference on this blog, so do stay tuned. I just heard the shocking news that John F. Nash, an INFORMS Fellow, in the inaugural class of 2002, and 1994 Nobel laureate in Economic Sciences, was killed in a taxi crash on the New Jersey turnpike. He was traveling with his wife of many years, Alice Nash, who also died in the crash. 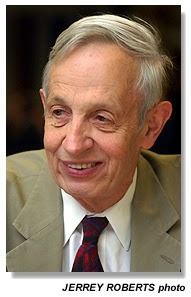 Just last week, John Nash had been in Norway to receive the Abel Prize for his contributions to mathematics. Here I am in Sweden writing another book and in almost every chapter I am citing the work of John Nash, specifically, his contributions to noncooperative game theory. It is such a horrible shame that he and his wife died in this way. He had a Brilliant Mind. He had lectured at UMass Amherst in October 2002 on Ideal Money and Asymptotically Ideal Money. The below photo is courtesy of UMass Amherst. I have written about John Nash and his influence on my work and that of others several times on this blog and I leave you with the link to a previous post. Rest in Peace, John Nash, and your wife, as well! Many, many thanks for your incredible contributions to mathematics, operations research, and economics! One might wonder why, once the academic year is over, a faculty member would travel thousands of miles to be a Visiting Professor on another continent? This is something I have been doing now for 5 years. Come mid-May I am off to the School of Business, Economics and Law at the University of Gothenburg in Sweden where I hold a Visiting Professorship in Operations Management. I have had an affinity for Sweden, going over many years, and it may be because I am of Ukrainian heritage and I would not be surprised if I had some good Viking blood in me. I always feel completely comfortable when I land in Sweden. My colleagues at the University of Gothenburg are always so warm and welcoming. I enjoy the research that we have done together, especially with Professor Jonas Floden, on various supply chain, freight, and sustainability themes, and the many conversations that I have had with faculty in the Transportation and Logistics group as well as in Finance and even in Energy Economics. I look forward to research that we will be doing. I also very much enjoy my interaction with students here on various transportation and logistics themes, including shipping and urban freight, as well as on financial topics. I have been here, this time around, only 10 days and already have had so many rich experiences. Below are some photos taken just during this past week. Nice to have the sign below on my office door and today the school was flying the Swedish flag. Celebrating last Thursday with Dr. Niklas Arvidsson and his wife, Alla, Niklas's dissertation prize with delicious Swedish food, of course at Hus Pelle, a restaurant with the same owner for 30 years. Loving the experiences of riding the trams in this very green city, some of which even fly the Ukrainian flag! Plus, how can you not love a place which hosts the biggest half marathon in the world, which took place yesterday, with over 64,000 runners from 64 different countries. The logistics behind the organization were tremendous, including the rerouting of several trams plus even having free boats to ferry passengers over the canals and under bridges downtown towards the Central Station - a great experience of intermodal transport! Working and living in a port city that is so forward in terms of transportation and policies is truly inspiring. I thank the University of Gothenburg and especially the School of Business, Economics and Law for such exceptional opportunities. I have had quite a few conversations at the end of this semester with faculty of different ranks. During the conversations, one of the topics that consistently emerged is that the faculty member felt that their contributions were not sufficiently recognized or valued, despite their efforts and hard work. I tried to pick my colleagues up and cheer them on but now that I am thousands of miles away in beautiful Sweden, where I consistently get my muse, I feel that the topic is of sufficient importance to write about on this blog. Especially at the end of the academic year, there are always many celebratory events such as banquets and award ceremonies in which recognitions such as teaching awards, research awards, and even service awards are noted. Some of the accolades are "local" in that they are given by the school in question, such as, in my case, the Isenberg School of Management, for example. Other recognitions are at the university level, which are done elegantly at our annual UMass Amherst Honors Banquet, where also national and international awards are noted that recipients have received during the year. Sometimes I wonder whether with all the emphasis on rankings in Business Schools, are we forgetting the human element? As we chase the rankings, are we steering research in directions that faculty may not be fully passionate about? If a journal is not on the identified list for your program to publish in, does that mean that you will turn down opportunities or feel that a publication in only an A level journal (since it is not Premier) does not matter? A colleague of mine stated that this is how he felt. I know from citations to my own work, that my books are highly cited as are articles that are not in premier journals although I have published there. And now - a colleague at ASU, with whom I am working on organizing a very cool symposium, let me know that on Google Scholar I hit an i10-index of 50. This means for those of you who are wondering, that 50 of my publications have been cited 50 or more times, which is pretty good, I am told. That in itself, is gratifying, even if this will not affect any ranking but, then again, it may when it comes to a school's reputation. Better to have faculty whose work is cited, I would think. Faculty (as employees) want to feel valued and appreciated and there are concrete ways in which this can be accomplished. I wonder why it may be hard for some administrators to give public acknowledgments, private thank you's, and even kind words in passing as to the work that faculty do. Of course, this holds not only for research but also for teaching and service. An institution is built on all who are part of it and faculty are the foundations. Under a previous administration, something known as an Exceptional Merit Award was initiated at UMass Amherst, whereby every 3 years a faculty member could apply (or, better yet, be nominated) for this award, which entails an increase (which can vary) in one's base pay. In order to get this award, one needs substantive national and/or international accolades. When rules of the game change, I can always go back and recall that, under two different Provosts, I received such an Exceptional Merit Award. Such a university recognition does give you some lift under your wings and is a concrete recognition. Of course, I tell my colleagues that even if you don't feel appreciated by your immediate school or college, excellent work does get recognized (sooner or later) and one should just continue doing great work that one is passionate about. I, specifically, laud professional societies such as INFORMS (Institute for Operations Research and the Management Sciences) for support of research of their members and their other professional activities through communities and various awards. Do send a colleague a congratulatory note, and copy it to administrators, if a colleague has published an article that she or she is very proud of. Do the same if a grant is received or even a student comments to you on how much he or she enjoyed a professor's class. In being driven to Boston Logan last Wednesday using UMass Amherst's Meet and Greet service, I had a great driver who is a Math major (so, of course, the conversation was fabulous). He spoke about a colleague of mine in Finance that was his favorite professor even though he is considered to be very tough. I sent an email to my colleague telling him about this. Do acknowledge work well done and an interesting paper or achievement by a colleague at a meeting of the department or even school and, most definitely, do it also individually! Or, as I sometimes do, even write a blogpost with congratulatory messages for notable recognitions. I do this for faculty and students. This helps to get the news out and will build a positive community. Administrators have their own challenges and sometimes they may just forget or be focused too much on their agendas and initiatives to spread the good word about faculty. It does not hurt to remind them! It's great to be back in Sweden. 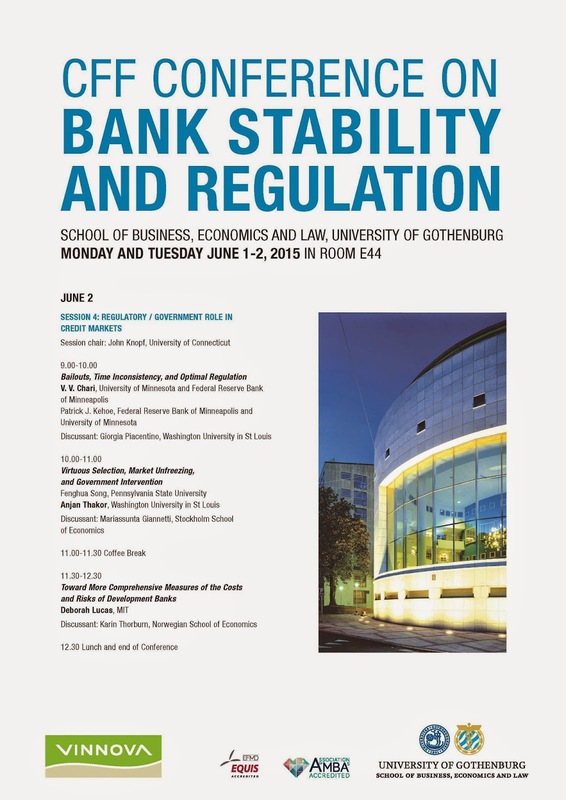 Since 2012 I have been a Visiting Professor at the School of Business, Economics and Law at the University of Gothenburg and I spend about 44 days a year in the beautiful city of Gothenburg. I arrived in Gothenburg on Thursday to a day of glorious sunshine which held up even yesterday. I am living in another part of the city than I have been in the past so it is a bit too far to walk to work since I would have to walk over a long bridge. So, instead, I have a monthly pass to ride the trolleys, which I love. The trolleys (sometimes called trams here) run frequently, are reliable, and are very comfortable - what more can you ask for! I will not be getting into a car for a month. A taxi brought me from the airport and the next time I will be in a car will be when I head back to the airport. I've already had a chance to explore some of my favorite spots in this very green city including the Slottskogan Park, where I was asked for directions in Swedish. I was able to give directions in English. It's also been delightful to find new foodstores and to carry the food home. Swedish cities and towns are so walkable and designed with amenities in mind. About 2 blocks from my apartment complex is a Saluhall where I can buy fresh fish, baked goods, and lots of fruits and vegetables. I am looking forward to seeing my Swedish colleagues at work on Monday! In a previous post, I provided links to our presentations at the Production and Operations Management Society (POMS) Conference, which took place recently in Washington DC. The photos below are of my present doctoral students, Sara Saberi and Shivani Shukla, along with my most recent PhD student at the Isenberg School, Dong "Michelle" Li, who successfully defended her PhD dissertation on May 4, plus my former PhD student, Professor Min Yu of the Pamplin School of Business at the University of Portland in Oregon. Nice to see members of the Supernetwork Team supporting one another professionally and personally. Great job, present and future female academics, and thanks for forwarding the photos! The POMS (Production and Operations Management Society) Conference is now taking place in Washington DC. Although I could not go since this (as happened last year as well) is graduation season at UMass Amherst, 3 of my present doctoral students are there (Shivani Shukla, Sara Saberi, and Dong Li, who defended her PhD dissertation just lat week) presenting our joint work and one former doctoral student, Professor Min Yu of the Pamplin School of Business at the University of Oregon, is as well. Two of our papers are jount with my collabortaor in Sweden, Professor Jonas Floden. Below I have posted links to our presentations. All of the presentations are based on recently published papers of ours with links also provided below. The full presentation can be downloaded here. 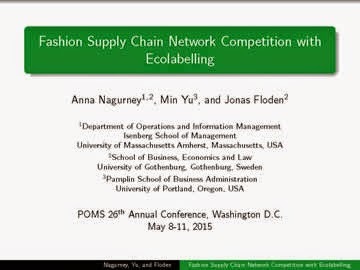 The presentation is based on the paper, Fashion Supply Chain Network Competition with Ecolabelling,.Anna Nagurney, Min Yu, and Jonas Floden, Sustainable Fashion Supply Chain Management: From Sourcing to Retailing, T.-M. Choi and T.C.E. Cheng, Editors, Springer (2015) pp 61-84. The full presentation is available here. 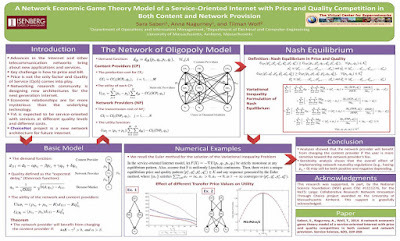 The presentation is based on the paper: A Supply Chain Network Game Theory Model with Product Differentiation, Outsourcing of Production and Distribution, and Quality and Price Competition,, Anna Nagurney and Dong Li, Annals of Operations Research 228(1), (2015) pp 479-503. The full presentation can be downloaded here., And this presentation is based on our paper: Supply Chain Network Competition in Price and Quality with Multiple Manufacturers and Freight Service Providers, Anna Nagurney, Sara Saberi, Shivani Shukla, and Jonas Floden, Transportation Research E 77: (2015) pp 248-267. Needless to say, I love doing research on all aspects of supply chains and am very lucky to have such great collaborators as those above. I'd like to wish all mothers out there a very Happy Mother's Day and to acknowledge all those who are no longer with us. It's been a truly fabulous week and I feel very lucky. As the Director of the Virtual Center for Supernetworks, I have the privilege and honor of working with a great team of faculty, industrial partners, and students. This past Friday, I sent out the following message to my team. All of those recognized in the message below were or are my PhD students in Management Science at the Isenberg School with the exception of my great collaborator Professor Daniele in Italy and the "other Professor Nagurney," who is my husband. 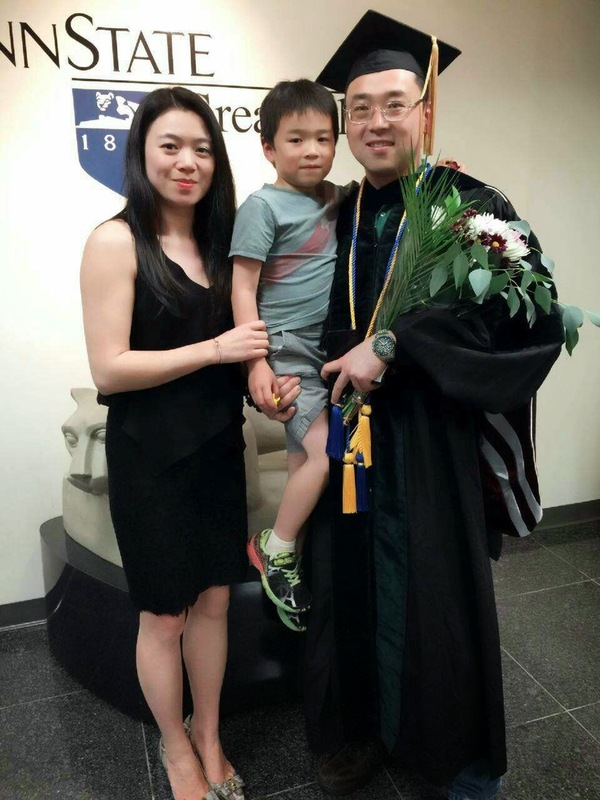 Also, the photo below is of Professor Patrick Qiang with his lovely family taken shortly after his receipt of Promotion & Tenure. I wanted to share with you some of the wonderful news and my CONGRATULATIONS! The next Supernetwork newsletter will be packed with Kudos. 3. Professor Jose M. Cruz has received the UCONN School of Business Faculty Service/Outreach Excellence Award. This award is presented annually to a faculty member for outstanding achievement in service/outreach. Jose has received 2 Ackerman Scholar awards and two teaching awards in previous years, so UCONN should just start naming their awards after him. 4. Professor Tina Wakolbinger of the Vienna University of Economics and Business has been appointed Senior Editor for the premier journal, Production and Operations Management, in the Disaster Management Department. 5. Sara Saberi received the Isenberg School's Outstanding Doctoral Student Researcher Award - she follows in the footsteps of Professor Min Yu of the University of Portland and Dong Li. Also, Sara is today at the POMS doctoral colloquium in Washington DC. 6. Professor Patrizia Daniele has organized sessions for the EURO Glasgow conference and I will be seeing her there as well as Professors Wakolbinger and Toyasaki, who will also be coming to the Dynamics of Disasters Conference that I am co-organizing in Greece. Professor Wakolbinger organized a stream and a session at Glasgow and Professor Amir Masoumi of Manhattan College will be speaking in the session. 7. Dr. Padma Ramanujam of SAS came back to campus to speak at an invited panel at an ISSR conference at which Shivani Shukla also had a poster on our latest cybersecurity research (with Professor Patrizia Daniele and the other Professor Nagurney, who will be on sabbatical this coming academic year). Happy Mother's Day to everyone and keep the great news coming! I am a very proud Academic Mom. The great news items above represent the best gifts that I could get as an Academic Mom! Congratulations to the Isenberg School Class of 2015! This morning, the Isenberg School graduation for our undergraduates, class of 2015 took place, with graduating seniors from our 7 departments being honored. The event took place at the Mullins Center at UMass Amherst and it was a joyful occasion, which flowed smoothly, and those of us in Operations care about such things. Associate Dean Linda Shea was a great emcee and had an inspiring speech. The student speaker was Lauren Casaceli, who has been a great ambassador for the Isenberg School, and has had a leadership role in organizing the very successful annual Women of Isenberg Business Conference. Dean Mark A. Fuller had closing remarks, took another selfie, and showed a video tribute to Gene Isenberg and his family. The faculty always enjoy shaking hands with the graduates from their departments and it was great to see so many Operations and Information Management graduates. I was hoping to see more parents afterwards but with about 1,000 graduates across all departments, that was rather challenging. The photos below I took before, during, and after the ceremony today. The faculty were resplendent in their academic regalia. The family members and friends of the graduates as well as other faculty after the ceremony in photos below.